Home Blog Cough In Children – When To See A Doctor? Cough In Children – When To See A Doctor? Children pose a great problem in perceiving the severity of their symptoms because they can not explain us their symptoms and severity the way we adults do. This is the mainstay of the reason why every parent should learn about the severity of some common pediatric symptoms. It is always better to be prepared not panicked about some common symptoms. Let’s talk about ‘Cough ‘ in this article. A cough is the most common symptom in children of all ages. It is actually a reflex mechanism to propel out irritants from the respiratory tract. It can be seen without any underlying disease and at the same time, it is also mimicking underlying disease. As a parent, it is very important to identify the type of a cough so that you can get some idea about the probable cause and severity of a cough. It is commonly seen under 3 years of age because of the smaller size of airways. It is due to swelling of larynx and trachea. It often starts in the midnight. Most of the children will also show Stridor (noisy breathing) along with a cough. In this, the child will show whistling sound while exhaling along with a cough. The child will also have breathing difficulty while playing outdoor games. It is commonly seen with Bronchial Asthma and Viral Bronchiolitis. This is also seen with foreign body aspiration in lungs. This is commonly seen with post nasal drip. In the supine position, secretions from the nose come down to the throat and cause irritation and coughing. It is commonly seen with rhinitis and nasal blockage. Night time cough is also common in asthma. It is commonly seen with allergies. Day time a child can expose to various allergens like dust, pollens, animal danders etc which can cause an allergic cough. It is due to infection with B. Pertussis bacteria. It is a loud noisy cough along with fever, neck swelling, sneezing, runny nose etc. GERD (Gastroesophageal Reflux), severe gastritis etc can cause a cough with vomiting. Sometimes asthma exacerbation (attack) can also cause a cough with vomiting. If fever is low grade then viral upper respiratory tract infection (URTI) is more likely. But if fever is high grade (above 102 degree) and child is having mucus production along with a cough then pneumonia is very likely. If a cough lasts for more than 2 weeks, it is known as a persistent cough. Most common symptoms for this type of a cough are allergic asthma and lower respiratory tract infection like pneumonia or tuberculosis. When To See A Doctor For Cough In Child? Has a high fever (especially if your child is coughing but does NOT have a runny or stuffy nose) above 102 degrees and have multiple spikes in a day. Use cold mist humidifier especially at the time of sleeping. You can also give luke warm water for soothing throat only after talking with your pediatrician. Better not to give over the counter cough drops especially for children below 3 months of age because these children can choke due to drops. Steam inhalation is also beneficial especially for rhinitis and nasal blockage. Start hot water in your bathroom. Close all the windows and doors of the bathroom. Sit with your child in the bathroom. This will create steam in the bathroom which can be inhaled by your child. Cool beverages like juice (without ice) can be soothing and it is important to keep your child hydrated. Better not to give aerated juices like soda. 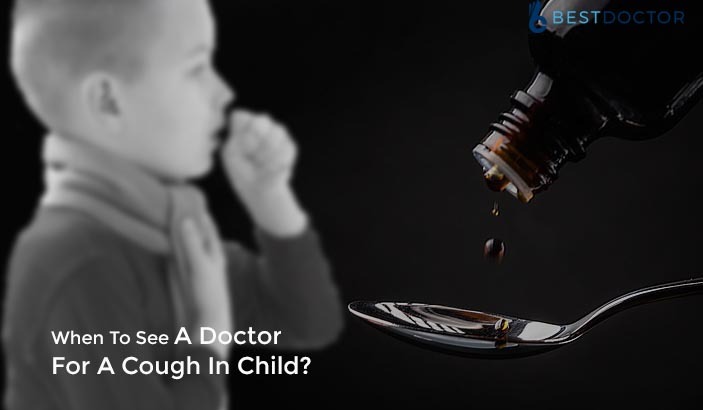 Better to consult your doctor at least once if your child is having a cough. Most of the times, a viral infection is a cause. This won’t require antibiotics as antibiotics work against bacteria, not viruses. Most of the doctors prescribe simple cough medicines and tell parents to maintain hydration. Breastfed babies are advised to continue breastfeeding. Dr. Kaushal M Bhavsar pursued his MD in Pulmonology. He is an Assistant Professor in Pulmonary Medicine, GMERS Medical College, Ahmedabad. Next PostHow To Book Doctor’s Appointment Online?